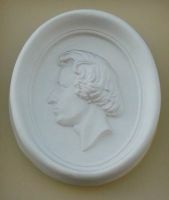 Fryderyk Chopin was not only a Pole but a true European and a citizen of the world. He is the most famous Polish composer although many people don't know that he was actually from Poland. 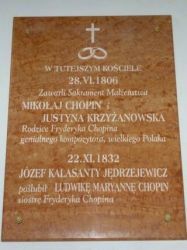 In 2010 Warsaw and Poland celebrated Chopin's (and his music) importance to the Polish and world culture on the occasion of the 200th anniversary of his birth. However, an introduction to his music and living environment is always a very important part of any visit to Warsaw (and some other parts of Poland) for individual travelers, organized tours and people traveling to Poland on business both from the country and abroad. Despite the passing time, complicated history of Poland and the fact that Fryderyk Chopin left the country for good in the middle of his life we have a lot of information about his family and childhood in Poland. Moreover many of the buidlings where the family lived survive until the present time. This gives any visitor to Warsaw and the province of Mazovia an opportunity to experience the environment in which Fryderyk Chopin grew up and which had an effect on his compositions. Although we usually tour the city of Warsaw first, in fact it is worth traveling 50 km / 30 miles west of Warsaw to Żelazowa Wola where the house in which Fryderyk's parents lived (when they were employed by the Skarbek family) and where he was actually born. It is in fact the only house of the entire estate still standing. The Chopins occupied the part of the house on the right hand-side from the entrance. 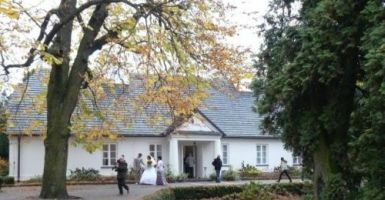 Today the house is surrounded by meticulously tended park and as we can see in the picture the whole complex is a popular place for taking wedding picutres. A few kilometers / miles away from Żelazowa Wola there is a village called Brochów where the parish church for Żelazowa Wola is located. In Brochów Fryderyk's parents got married and he was baptized. Fryderyk's father, Nicholas (Mikołaj - don't be surprised that in most places you will find the Polish equivalent of his given name only) Chopin, was French. He was born in Marainville in Lorraine where he worked in the employ of the Weydlichs, a couple working for a Polish count. When they were returning to Poland they offered to take Nicholas with them. He took up the invitation and moved to Warsaw. He did not spend a lot of time in the city. The letter he wrote to his parents in 1790 remained unanswered and Nicholas decided to stay in Poland for good where he eventually became teacher of French and other subjects at manor houses of the Polish gentry. He was among other a teacher of Maria (née Łączyńska) Walewska - Napoleon's sweetheart. When children in the Łączyński family grew up Nicholas Chopin moved to the estate of count Skarbek at Żelazowa Wola. This is where he met his wife, Justyna née Krzyżanowska. Birth of their second child, Fryderyk, coincided with a job offer for Nicholas to become a teacher of French in the best secondary/high school of Warsaw at that time. The Chopins moved to Warsaw and besides father's teaching career they ran a prep school for boys from noble families preparing to enter Warsaw schools. They were among the most expensive and the best in town. Not all houses where the Chopins lived survived the WWII but in general the neighborhood remains pretty much the same. The family lived around the Krakowskie Przedmieście - today's Warsaw University area and one of the nicest and most representative streets of Warsaw. When walking around you will find not only plaques marking the places where the Chopins lived but also many historic monuments and the Presidential Palace. 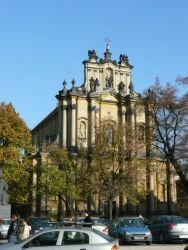 One of the buildings where Fryderyk left a mark is the church of the convent of the Visitandine nuns where Fryderyk Chopin played at school masses and the church organ until today remains the same instrument he played. Not far away from the Krakowskie Przedmieście (at Tamka Street) you can visit the biographical museum of Fryderyk Chopin. The museum has been completely rearranged and the exhibition modernized so it is definitely worth a visit. If you are in Warsaw on Sunday don't miss a free Chopin recital. 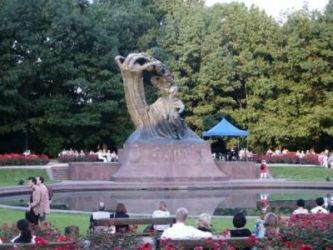 They are organized every Sunday in the Royal Łazienki park by the statue of Fryderyk Chopin. Usually they run from June to September and are one of big attractions in Warsaw attended regularly by many Varsovians, their guests and visitors to Warsaw from all over the country and the world.